A child’s hand is a powerful tool for learning. With his hands he can control the world around him, build and create all that he can imagine, and express himself, first in gestures, then with scribbles, and eventually, with the written word.Parents know the importance of fine motor control — especially when it comes to handwriting — which is probably why I’m frequently asked for advice on this subject.Here’s what I say…Put your pencils down and go play on the monkeybars. 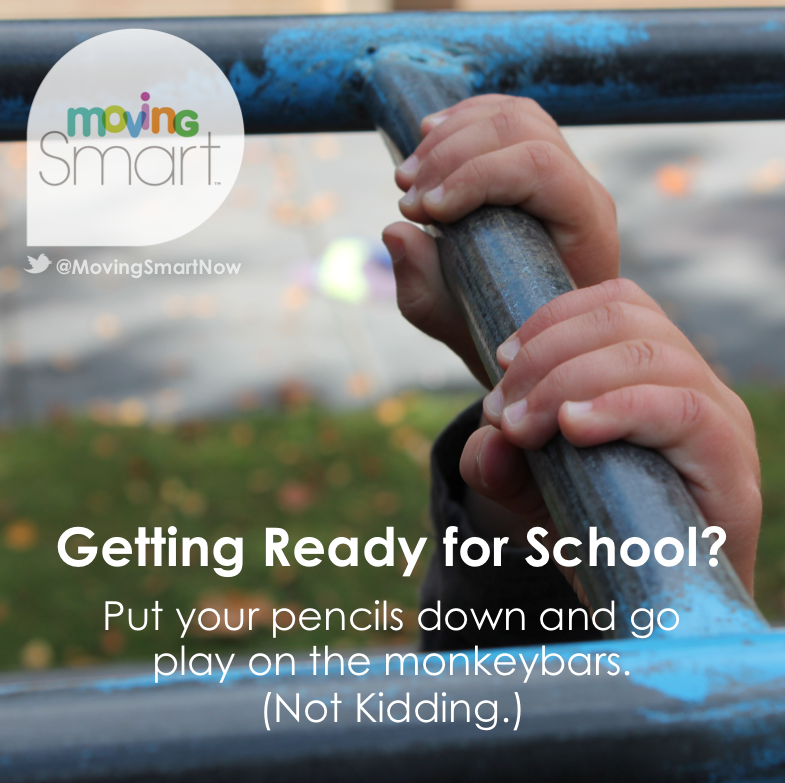 Now, that doesn’t mean that your child’s hands aren’t active as he’s growing. Young hands begin with simple, reflexive, whole-hand grasping. Over time, early reflexes integrate and the pincer grip kicks in, allowing him to use his forefinger and thumb together in unison. Each day, you’ll see more and more deliberate hand and finger movements. But that’s not fine motor skills — not yet. 1. The upper body must be strong enough to hold the body in an upright standing or sitting position. 2. 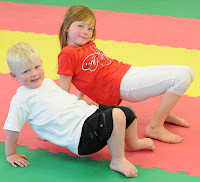 The shoulders muscles must be strong enough to control the weight of the arm, and flexible enough to rotate freely to position the arm for writing. 3. The upper arm holds the weight of the lower arm and hand, delivering the hand to the page. 4. The lower arm provides a sturdy fulcrum on which the wrist rotates. 5. The wrist holds the hand steady and rotates to the appropriate position. 6. The fingers fold around the pencil which is held in place by the thumb. 7. Together, all five fingers do a precision dance on the page: a. placing the pencil at the exact angle to meet the page, b. pressing down and maintaining the right amount of pressure to leave the imprint, and c. coordinating the tiny up, down, left, and right movements across the page. If any of those muscles in that chain of events don’t do their job, writing his name will be a very hard thing to do. 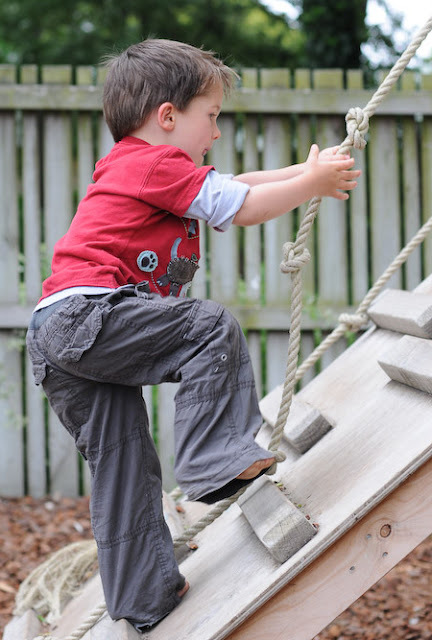 Climbing, hanging, swinging, and any other high-energy activities that build strength in his upper body and core muscles are vital precursors to fine motor skills. Twisting, turning, dangling, and swinging helps develop the flexibility and agility necessary for rotating the shoulders, elbows, wrists, and fingers. So remember. 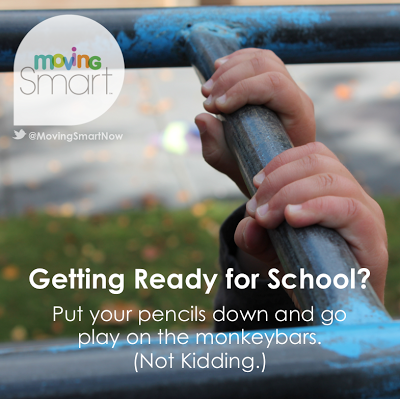 When it comes to getting ready for writing, “M” is for Monkeybars! while the hands “wait their turn” in the developmental chain of events. 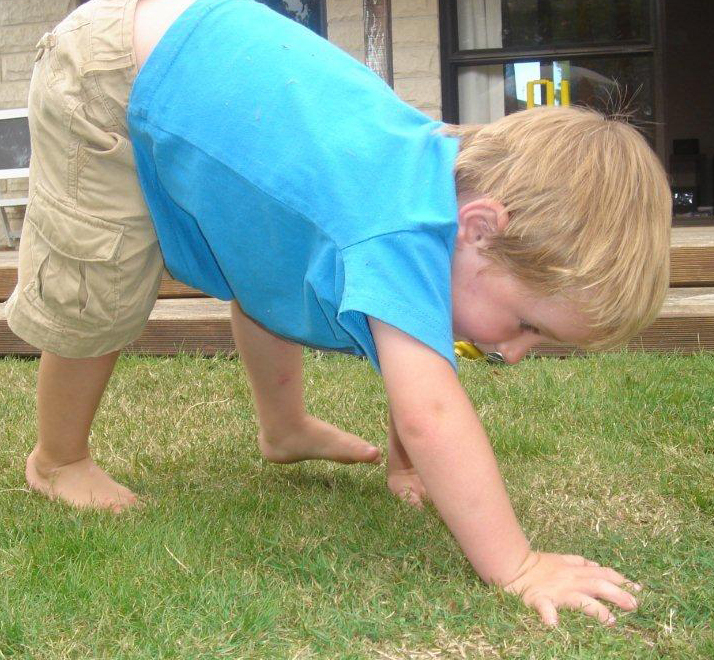 CATERPILLAR WALKING – See how slow you can go, inching along like a caterpillar! Walk your hands out in front of you, then walk your feet up to your hands. WHEELBARROWINGWheelbarrowing around the playroom or out in the backyard is great for building up arm strength (in between the giggling, of course.) Importantly, I recommend holding your child at the hips rather than by the feet. This prevents an unnatural bow in the back, while lightening the load on those little arms. Kids love this and you’ll be amazed how far they can go with a little practice. Sit on the floor and raise up your seat using your hands and feet. Then crab – crab – crab along as far as you can go. 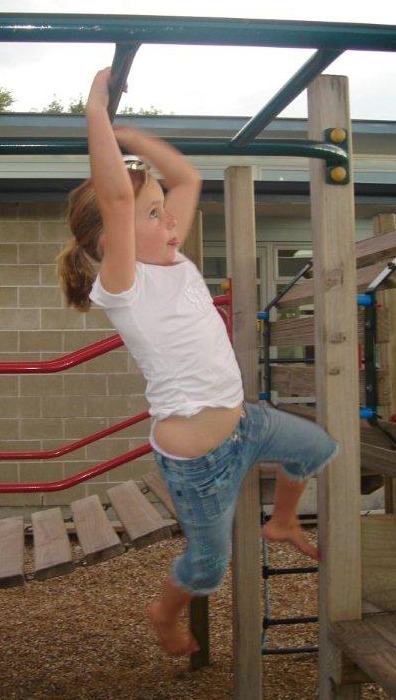 Have kids go forwards and backwards too! 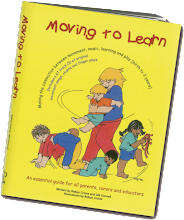 Making the connection between movement, music, learning, and play (from birth to 3 years). Includes CD of 67 original songs and finger plays!